Established in 1950, Watford Town Cricket Club is situated within close proximity to Watford town Centre, in the residential area of Garston. Boasting one of the largest grounds in the Hertfordshire league, excellent facilities and a friendly atmosphere. The picturesque playing facilities are perfect for young children and families as they are contained by woodland and surrounded by playing fields. An ideal choice of club to play for wherever you are situated as the ground is close to both J19 of the M25 and within a mile from the M1′s J6. Watford Junction train station is also located nearby providing rail links to the north and Central London( 30 mins). Watford Town play in the Saracens Hertfordshire Cricket League with the first eleven competing in Division Two A, the second eleven in Division Five A, the third eleven in Division Ten B, a 4th eleven in Division Regional B West and a 5th eleven in Division Regional C West . The Club also participates in Sunday youth development cricket and the Chess Valley League tournament. We also play a number of 20/20 midweek games too. Senior training during the season is held at the ground on a Tuesday evening from 6pm onwards. There are both artificial wickets and grass wickets available for net practice, Also available is one on one guidance from our Club coach/Manager . All are welcome, please feel free to come along and introduce yourself and join in. Development coaching for children is held on a Sunday morning from 10am-12am. Coaching is provided by senior team players and all ages are welcome and catered for, parents are welcome to come and provide support by having a cup of tea and cake in the clubhouse and watching the session. Last season we had aprox 150 children ranging from 6-16 attending on a regular basis as well as many parents that socially gathered to watch and relax outside while the session commenced. If you have any queries or you are interested in bringing your child to one of our sessions, please call Gulfraz Riaz on 07968443546 for further details. 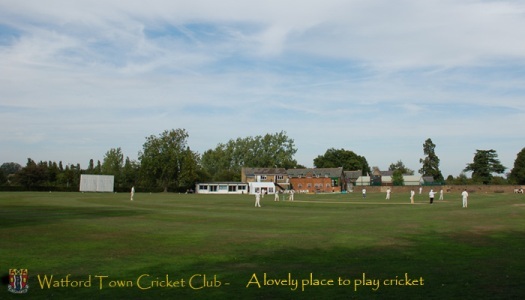 JOIN US – If you are interested in joining our club and playing in the Hertfordshire League, or as a social member to watch cricket and use the bar facilities then please click here.